Power Required 5 X 1440 H.P. Stand Wire and point wire 12/12 SWG. VIZ. 2.5.-2.8/2.5.-2.8 m.m. diameter. H.B. Fully not dipped galvanized wire with under 30 kg. F/MM to 50 kg. F/MM. 3″ to 4″ pitch also adjustable with additional gears in winding unit whichever could be applied only under special demand. Our major emphasis are upon its adjustability of pars and easy maintenance. Operator has an easy approach in setting all arms, cutters by making the machine parts fool-proof. It ensures easier dismantling, assembling, loading unloading as well as consequent view over flow of formed wire. All the adjustable parts are altogether accessible and machine standards. It requires 5hp slow speed, 3hp 50c/s squirrel cage induction motor with reversible Stater which is not supplied with the machine. 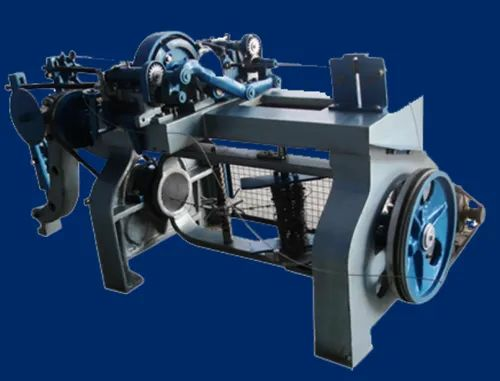 The machine is designed in its heavy structure using closed grain cast iron and steel in EN-36. All the gears are processed by bevel generator and hobbling. The machine is 1200 kg. in weight (App.) exclusive of pay – off stands.